EDINBURGH, Scotland, 2017-Oct-24 — /Travel PR News/ — A TRADITIONAL country clothing store, gift shop, café, pottery studio, pub, shoe shop and self-catering accommodation are among a group of local businesses in Kelso to join an innovative scheme to provide first-class information to visitors. More than ten businesses from local community group Visit Kelso have joined a network of VisitScotland Information Partners (VIPs) by committing to actively promote the local area and services offered by local businesses. The initiative is designed to allow those working within the tourism industry to become local ambassadors for their town or region, providing visitors with first-class information about things to see and do both locally and further afield. A Hume Country Clothing, One Basket, Focal Point Furniture, Kelso Pottery, Kelso Border Retreats, Rutherfords Micropub, Seasons, The Cream Chimneys, Borders Cookware and Swans Shoes are just some of the businesses in the town to sign up to the scheme, as part of Visit Kelso. Other members of the community group include Floors Castle, the Roxburghe Hotel and Golf Course, Kelso Holiday Cottages, Border Holiday Homes and Hendersyde Farm Cottages. They join a network of more than 80 VIP partners across the Scottish Borders providing inspirational local knowledge to visitors to the region. 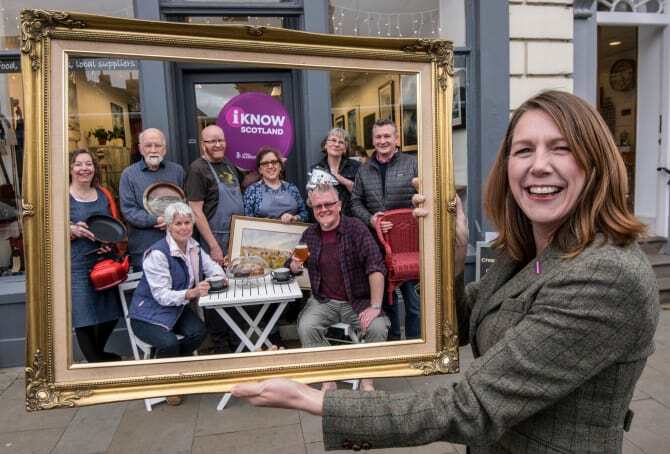 The new official ‘iKnow’ accreditation will add value to the service they offer and make it easier than ever before for visitors to connect with local businesses. Nikki Allman, Secretary of Visit Kelso said: “As a group of local business owners in Kelso and the surrounding area, we realise how important it is to share our local knowledge and insights with our visitors to help make sure they receive a warm welcome and make the most of what there is to see and do in the local area. “We have members throughout the town of Kelso and the surrounding area and are therefore ideally located to offer visitors access to information to help enhance their experience and help showcase the tourism offer in the area. “We want our visitors to have a great time in this wonderful part of the country and we are looking forward to continuing to ensure visitors enjoy a first-class experience. Paula Ward, VisitScotland Regional Director, said: “Visit Kelsodoes an amazing job at attracting and offering a first-class experience to visitors of Kelso and we are delighted to welcome the group to our VIP programme. It is well-deserved official recognition of the fantastic work that the group already undertakes to promote the local area. This entry was posted in Arts and Culture, Attractions, Business, Tourism, Travel, Travel Marketing, Travel Services, Travelers and tagged Nikki Allman, Paula Ward, Visit Kelso, VisitScotland, VisitScotland Information Partners programme. Bookmark the permalink.